An Apple patent filing published Thursday describes a mechanism capable of directing light from two apertures onto a single image sensor, facilitating smaller iPhone form factors while ensuring identical image quality from both front- and rear-facing cameras. As published by the U.S. Patent and Trademark Office, Apple's patent application for a "System and method for capturing images" combines a novel array of electrically switchable mirrors, lenses and other components to channel light from two or more apertures onto a single image sensing module. Applied to iPhone and iPad, the invention could mean smaller devices, consistent image quality and potentially cheaper hardware. A bulk of today's filing deals with techniques of directing light from at least two separate entrance points onto a single sensor. Currently, Apple's portable devices sport front- and rear-facing cameras, which are respectively branded iSight and FaceTime HD with the latest iPhone 6. Due to internal size constraints, the FaceTime HD "selfie" camera uses a smaller, lower resolution sensor compared to its 8MP iSight sibling. Today's invention seeks to replace this multi-sensor setup with a single imaging package. 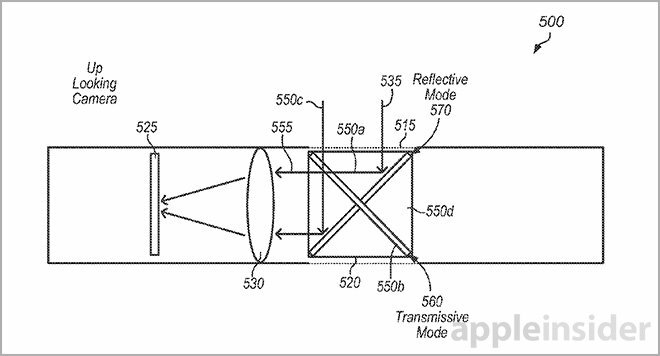 The goal of Apple's system is to redirect incoming light from two apertures, or lens-covered openings in an iPhone or iPad chassis, onto one sensor. In some embodiments, light enters the device from two opposing directions, much like current iPhones, but instead of hitting a sensor directly after exiting a series of lenses, it is bounced off of machine controllable mirrors. 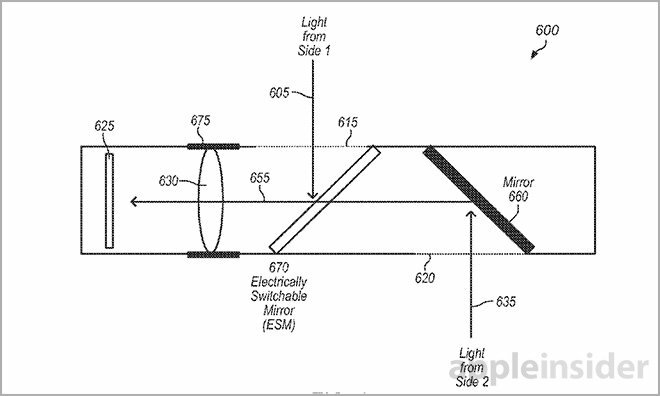 Electrically switchable mirrors are therefore key to Apple's proposed design. These components are capable of transitioning between reflective and transmissive modes when an electric current is applied, allowing for highly adjustable light manipulation without moving parts. Mounted at an angle using transparent support structures, the one or more ESMs redirect light entering either the first or second aperture to an internal lens element and onto an image sensor. A moveable lens apparatus is also implemented to compensate for distance differentials between the first aperture to the image sensor, and the second aperture to the same image sensor. 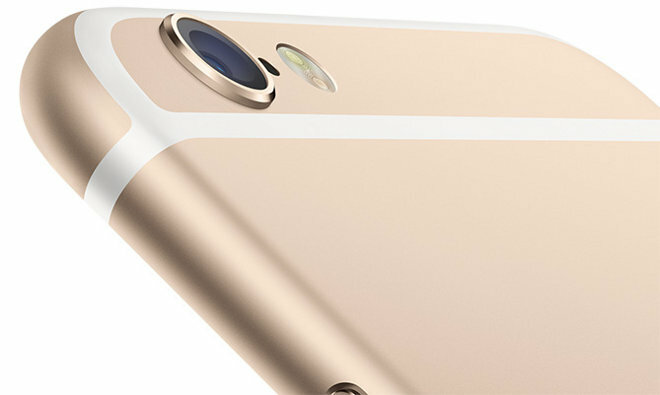 In one embodiment, Apple describes an arrangement with one ESM and one standard mirror. A first signal puts the ESM into reflective mode, thus directing light from a first aperture to the internal sensor. A second signal invokes transmissive mode, allowing light entering a second aperture opposite the first to pass through, hit the standard mirror and reflect down onto the sensor. Another embodiment, as seen above, figures in a second ESM. In this case, a third signal forces the second ESM into complementary transmissive mode, allowing incoming light entering the first aperture to pass through to the sensor. The signal is timed to complement the reflective mode of the first ESM. A fourth signal switches things around and puts the second ESM into complementary reflective mode to reflect stray light from the first aperture away from the sensor. The fourth signal is likewise timed to complement the first ESM in transmissive mode. The document further covers alternative designs including varied ESM timing, single-piece ESMs, ESMs composed of multiple pieces, alternate mirror arrangements and more. It is unclear if Apple intends to employ such advanced camera technology in an upcoming iPhone model, but the company is already pushing the limit with successively thin device designs. Soon, a single component or assembly will likely dictate how thin Apple can take iPhone and iPad. Earlier this year, SVP of Design Jony Ive admitted his iPhone 6 design was too svelte to completely incorporate Apple's iSight camera module, resulting in "camera bump" that breaks up otherwise clean lines. Apple's mirror-based single-sensor camera patent application was first filed for in September 2013 and credits Ning Y. Chan as its inventor.